“I am a Midwestern country girl from rural Ohio. The baby of five! My parents, Steve and Vicki Price, raised us in a conservative, Christian home and they have been our source of steadfast love and undying faith in God. ‘Growing up Price’ meant you were blessed with a tight-knit family, a prayerful set of parents, dinner at the table every night, no excuses to miss church, and a lot of family fun. But as many kids do, I started carving out my own path during high school and found myself making poor decisions. I was with people my parents didn’t approve of and living a life that frightened the people who loved me most. I sacrificed a life with my loving family to follow a boy that walked a wayward path, leading to nothing but a dead end and loss of self. I was willing to compromise my faith, my values, and disappoint my family in an attempt to please a person who did not have my best interest at heart. Those selfish desires kept me from listening to my parents’ warnings, and I found myself in the depths of darkness and worry. My relationship with my siblings and my parents became fractured. I lied and disrespected them to protect people that were poisoning my thoughts. I was broken, lonely and lost. I was surrounded by people leading dangerous and immoral lives, but didn’t know how to crawl out of the dark place I had landed in. I felt like an absolute failure, I felt guilty for causing so much heartache. But I didn’t know how to rectify it. Through the turmoil, my parents stuck to their guns. They loved me, but they were not willing to accept my choices. They stood by their word, they didn’t bend, they still loved me, but begged me not to walk away. Despite their pleading, I left home. That’s when my relationship with my dad was particularly broken. I could see the pain I was causing him by continuing down a road that was laced with toxicity, led by a boy he strongly disapproved of. At a distance, my parents were steadfast in prayer, fully trusted Jesus, and were willing to wait for Him to work on my heart… and lead me home. Their prayers didn’t go unanswered. Finally I reached a place where I started feeling Christ wrestling within me. I started to realize that wasn’t where I belonged. I started listening to the truth and remembering who DID love me. I looked around and saw nothing familiar, no warm dinners with family, no Sunday mornings at church, no laughing in the living room with my sisters and brother. No hugs from my Mom. No goodnights from my Dad. I had walked away from a life of safety, protection, faith, wonderful family and friends, and TRUE love. And I was sitting in a mess. But God nudged me enough to find the courage to call my mom. I told her I was ready to come home. She dropped everything and came after me. Even though I knew I was doing the right thing, I was scared to face my Dad. I thought we would never be able to repair the damage I had done. I was wrong. Like the loving father I had always known, he extended his grace and we started to mend the wounds. With that one decision to return home, my life started moving in the right direction. I started redefining my goals, and my future. Fast forward a couple years, I was introduced to a guy named, Jesse Hauger. I took a leap of faith and agreed to go on a date, and then another, and another. We totally clicked. He is funny and good-hearted and hard-working and a follower of Christ. My family loved him quickly. He embraced my big family, he didn’t alienate me from them. He jumped in with both feet! My parents love him like a son. Jesse quickly became the man of my dreams. He treated me in a way that reminded me of my parent’s relationship. I could feel myself start to regain joy again that had been lost. I trusted him. A few years later, on a family trip to the Bahamas…with my parents and sister’s and their families… he proposed. And it was then, I looked back on my journey and realized how fortunate I was to get to this very place. There I was, redeemed, restored, and surrounded by people God placed in my life that love me unconditionally. Of course, I said yes. The wedding was set for August 11, 2018. My Dad got to work restoring the old barn on our family farm to use as our wedding venue. It meant so much to me to be married at home. Where I was raised. Where I learned about God’s love. Where my family was built. And ultimately, where I was healed. Dad worked tirelessly to make it ABSOLUTELY PERFECT! In a barn I grew up raising my 4-H animals and playing hide-n-seek with my siblings… I would be marrying Jesse. A week after returning home from Nashville, my dad got acutely ill and was rushed to the hospital. Unexpectedly, he was diagnosed with Acute Pancreatitis. It ended up spiraling into a very severe case. 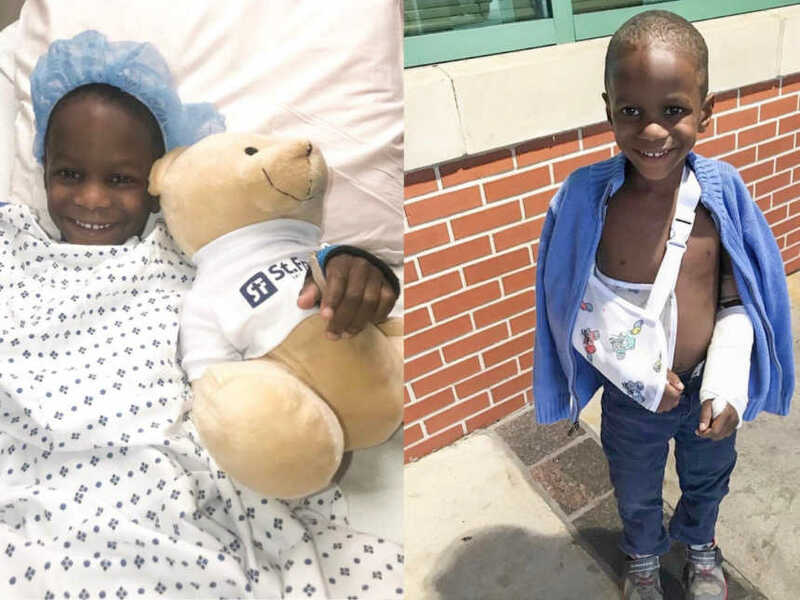 He has been hospitalized for 3 weeks and faced several serious complications despite aggressive medical treatment. He was transferred to The Ohio State Wexner Center and we were praying he would recover in time to be at the wedding. 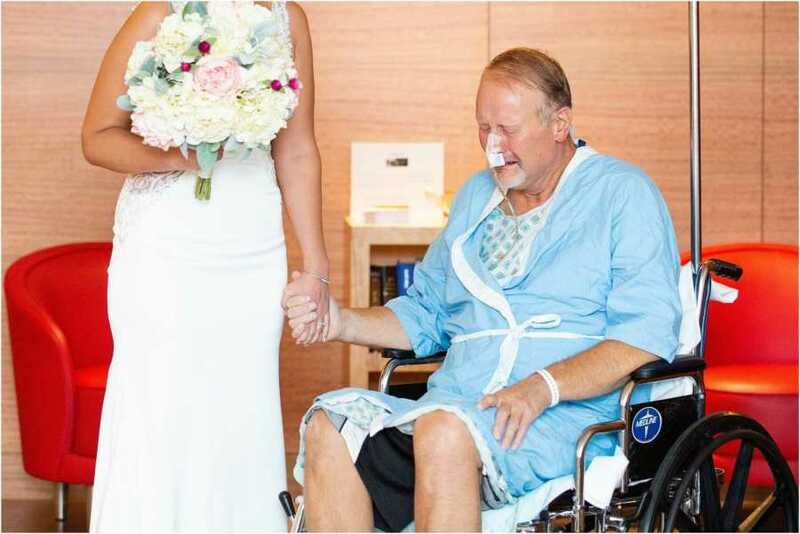 Unfortunately, two days prior to the wedding, the doctors told us it would be best for him to stay there to heal. It crushed all of us. 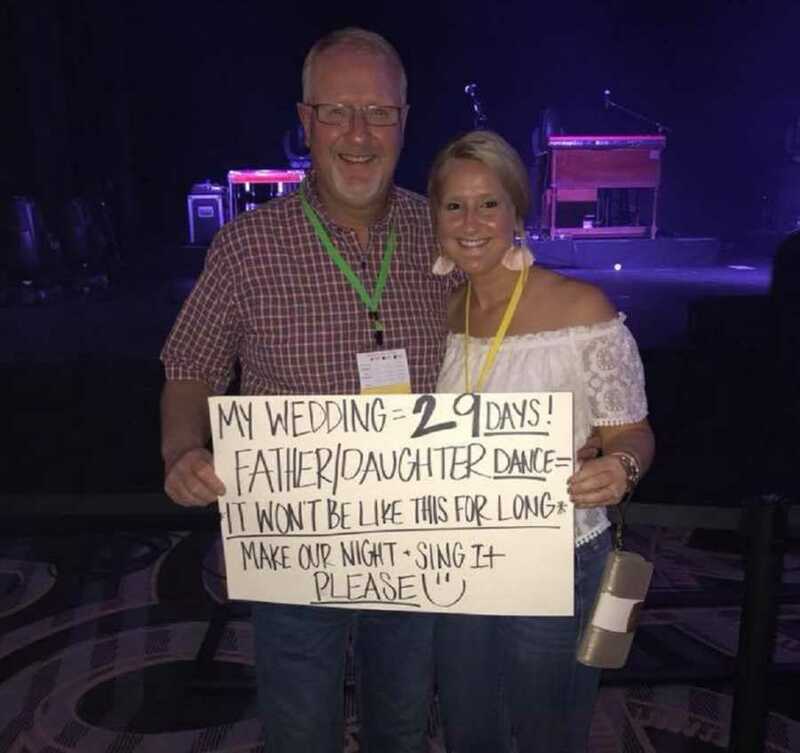 My dad has dreamt of the day he would be able to walk one of his daughters down the aisle in his barn. I realized he wouldn’t walk me down the aisle, he wouldn’t be giving me away, and there would be no dance. But Dad’s healing and medical care was my first priority, not my selfish desire to have him there. Jesse and my family stepped up to the plate. Countless hours were spent at Dad’s side in the hospital as we were watching him anguish through inconceivable pain and multiple setbacks. But God remained faithful. 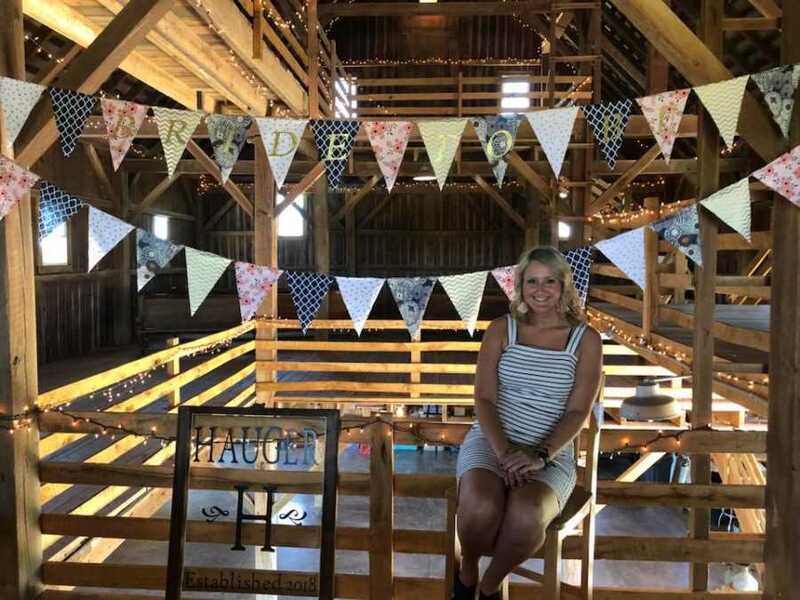 Family and friends were at the farm taking over wedding preparation, a community of people were lifting all of us up in prayer, and our church family was amazingly helpful. The support was overwhelming. The wedding day arrived, and it will forever be etched into my heart. 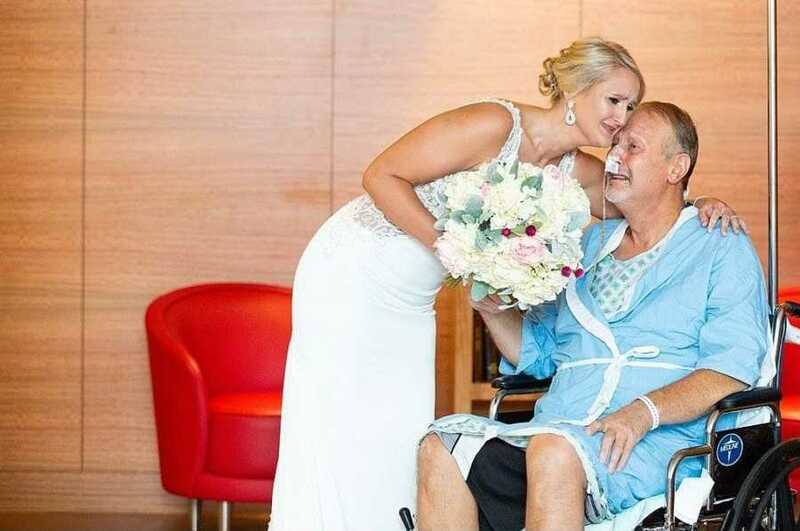 We decided if Dad couldn’t be at the wedding, we’d take the wedding to Dad. We coordinated with the wonderful nurses at the hospital to help orchestrate the best surprise. 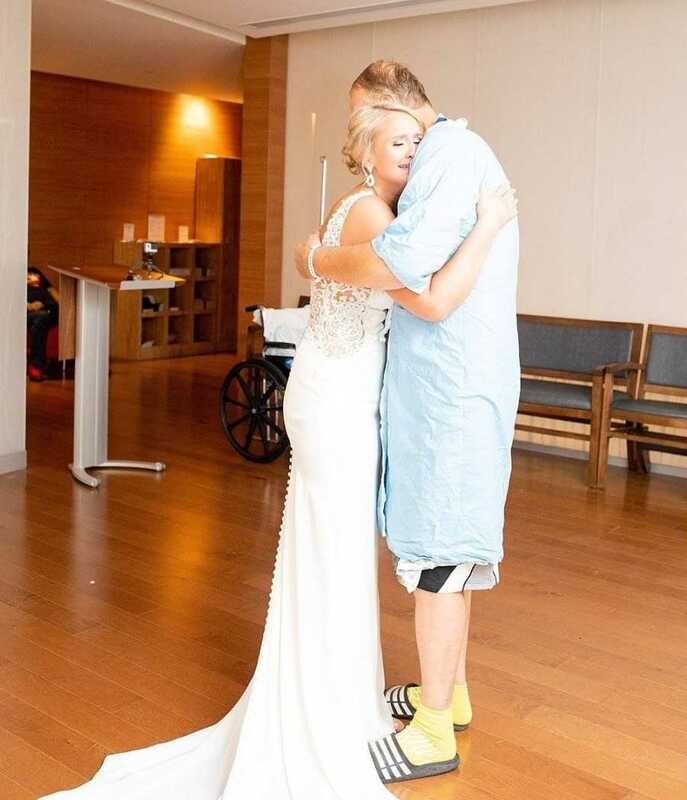 A few hours before the wedding, his nurse wheeled the wheelchair into his room and said the doctors were requesting an X-ray. 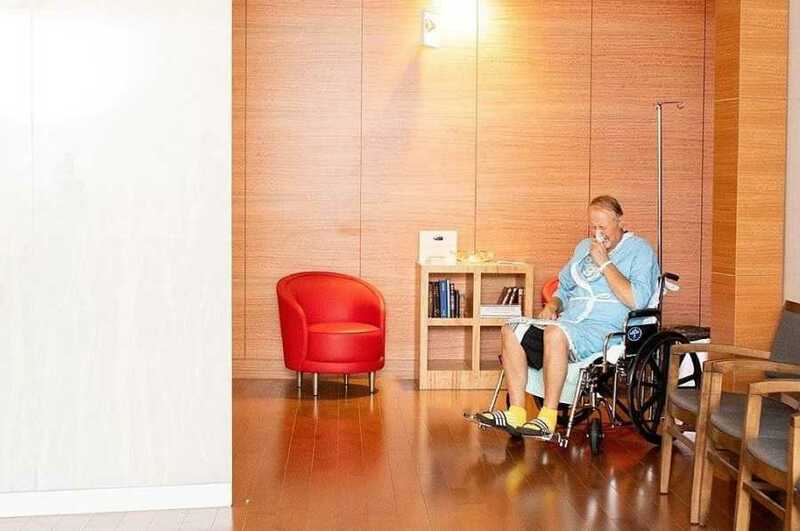 Hooked up to tubes and IV’s, the nurse disconnected Dad and wheeled him off to what Dad thought was the X-ray department. 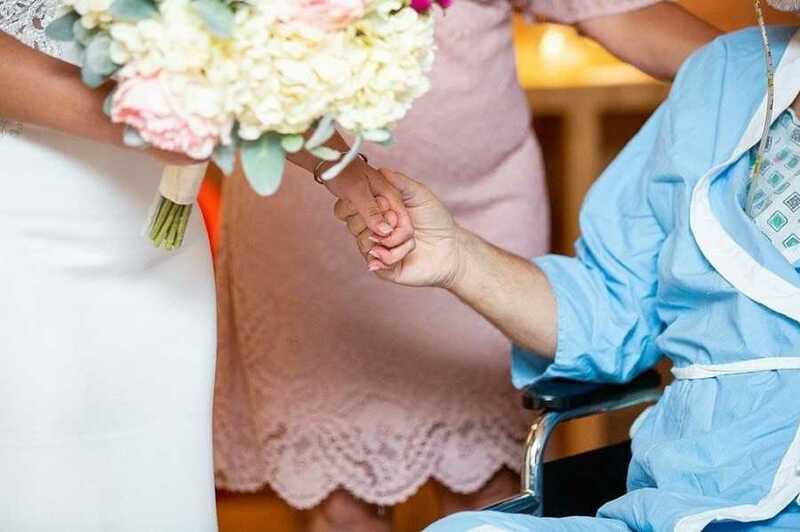 Down the elevators and through the halls, Dad rode to his ‘X-ray,’ but instead, into the Chapel he was pushed — to find me at the altar dressed as a bride, along with my mom and three sisters and brother, all wedding ready. 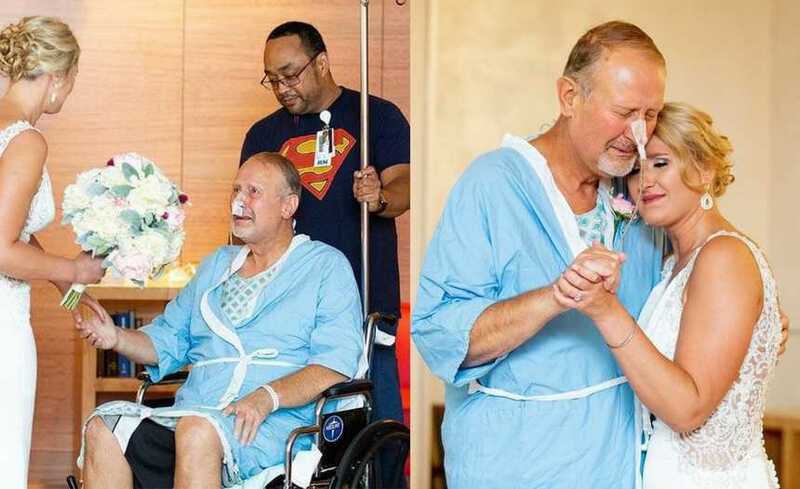 He was beaming, and tears and joy filled the room. This past month has been a roller coaster full of mixed emotions. 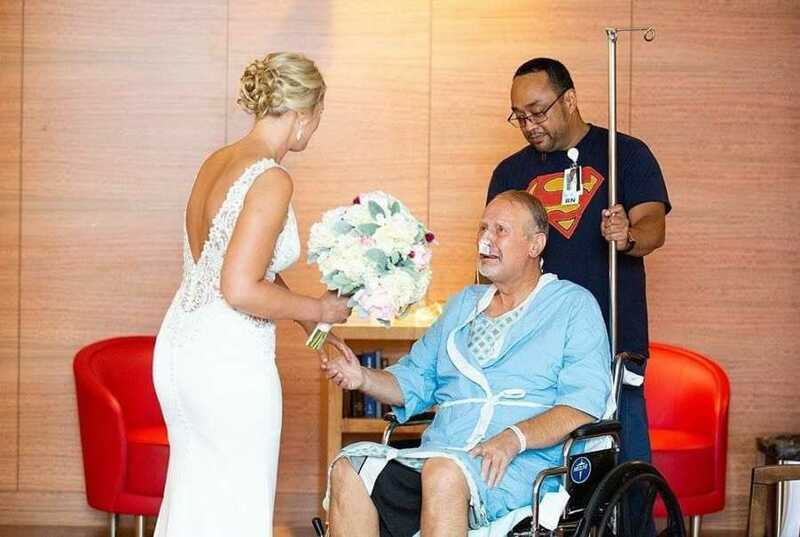 A wedding itself is emotional enough, but with my dad being in and out of the hospital, I knew it would be a battle. The moment he saw me is a moment I will never forget – there were A LOT of tears, but a lot of laughs too. Then, we danced… to our song… and we cried. It was an intimate moment I will cherish for my whole life. Though I wish he could’ve walked me down the aisle and dance with me at the wedding, it was a moment I will cherish forever. I love you, Pop! You have sacrificed so much for me and I am blessed to have the best dad in the world. I love you to the moon and back. 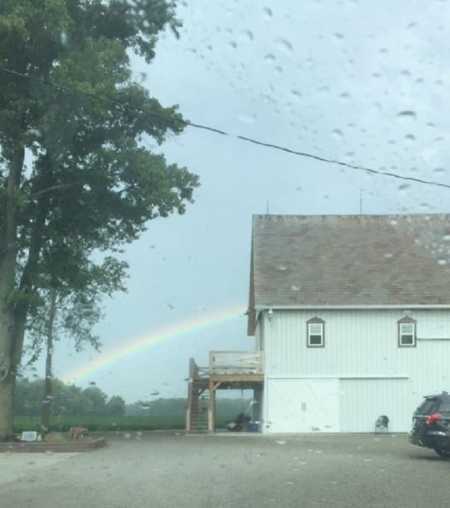 The night before our wedding when I pulled into the driveway to find a rainbow hanging in the sky right over our barn, it was my reminder that God’s got this. 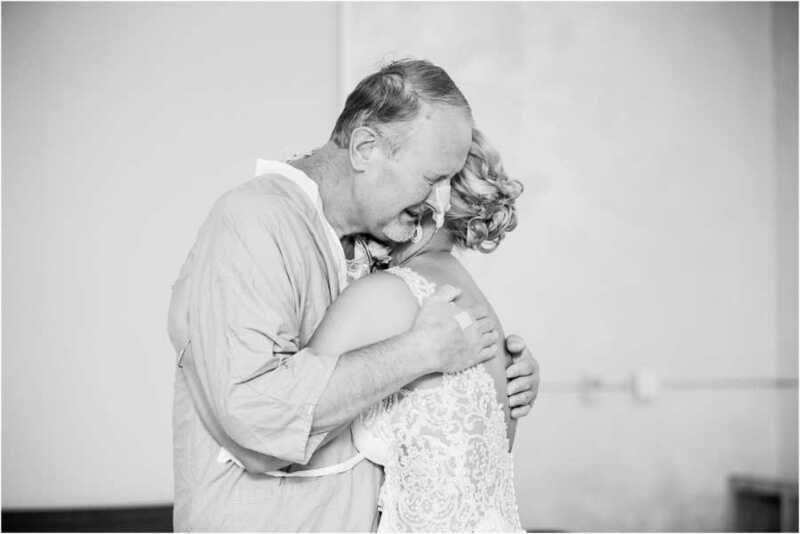 Dad is in His hands, and our wedding day was full of joy despite our weeks of stress and concern. We were blessed to have Tyler and another family friend set up an interactive live feed so Dad could witness the wedding on the farm later than evening. He was ‘virtually’ there. 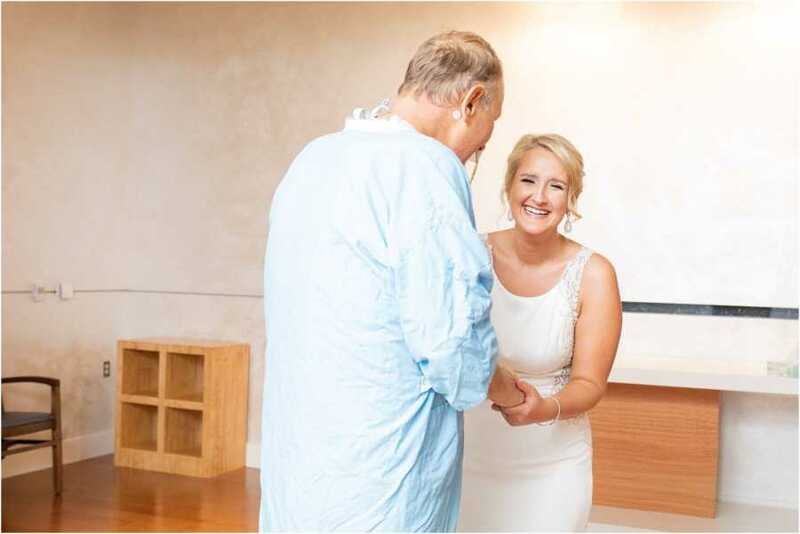 When the barn doors swung open and it was my time to walk down the aisle, I was arm-in-arm with my brother and my mom… and Dad was the first person I saw (giving us a thumbs up on the iPad screen) before I turned the corner to face my groom. It was as perfect as possible. Dad was able to witness all the details — the beauty of the barn he worked so hard on, the joining of our family with Jesse’s, he heard our vows, and could even talk to our guests… and give his blessing. 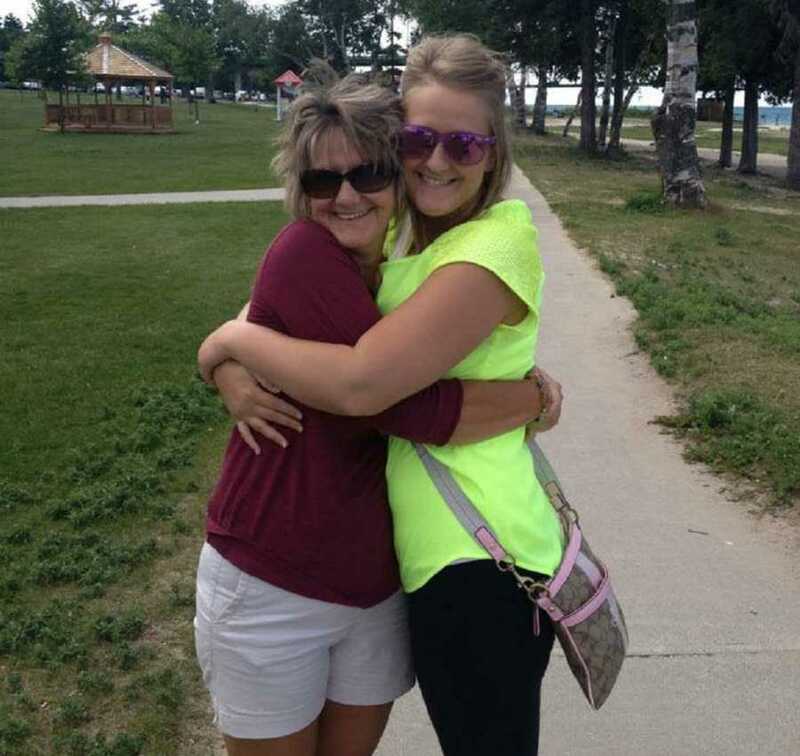 This story was submitted to Love What Matters by Janae Hauger of Richwood, Ohio. 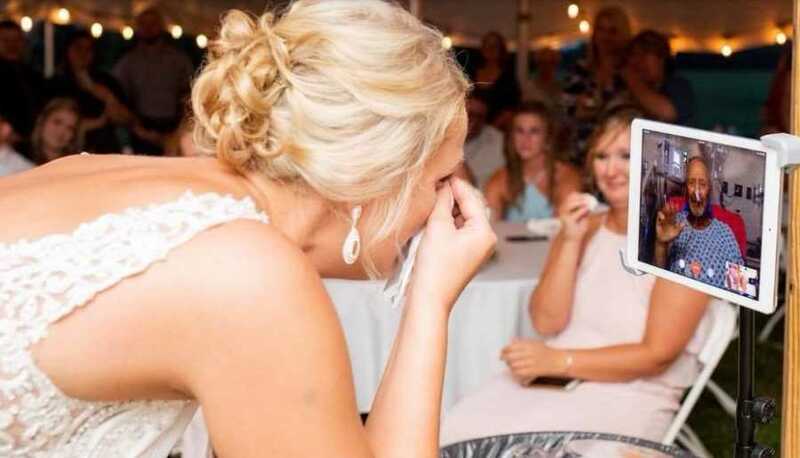 Do you have an emotional wedding story to share? We’d love to hear your journey. Submit your own story here, and subscribe to our best stories in our free newsletter here. 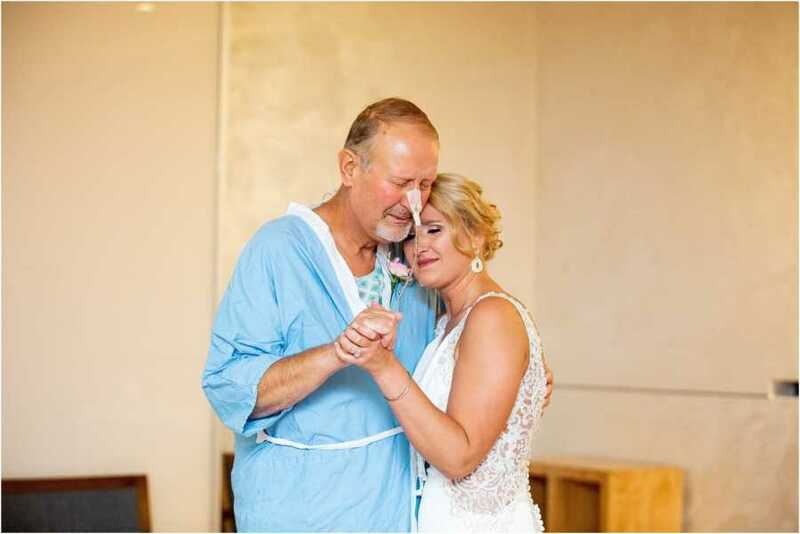 SHARE this story on Facebook if you believe there’s nothing like a father-daughter bond.